I’m so excited to share this easy crochet coffee mug cozy tutorial today! Seriously, it’s so easy that you can have one finished and hugging your coffee mug in only a few minutes. This would be the perfect gift for Mother’s Day, Teacher Appreciation week, or really any occasion on which you might like to give something handmade. I find that people love receiving something specially made just for them; in my own case, I find that a gift is more valuable to me because I know the effort that someone put into making it for me. 1. Mugs: try to find a straight-sided mug, to make the process easier. I like this personalized mug (affiliate link) that I found on Tiny Prints. Hint: Take 20% off your order with the code TINYPRINTS20 at checkout. 2. Beginner’s crochet tutorials: I learned crocheting by watching videos on You Tube. My favorite is HappyBerry Crochet…she has several beginners videos, but she does such a good job of explaining that I was able to make a pair of adult slippers on my first-ever try at crochet. Her patterns are just adorable too! You can also download Craftsy’s eGuide: The Beginner’s Guide to Crochet for FREE (affiliate link) to help you get started. 3. I found the pattern for this tutorial at All About Ami. She has many other nice patterns, including a beautiful afghan that I want to try soon. 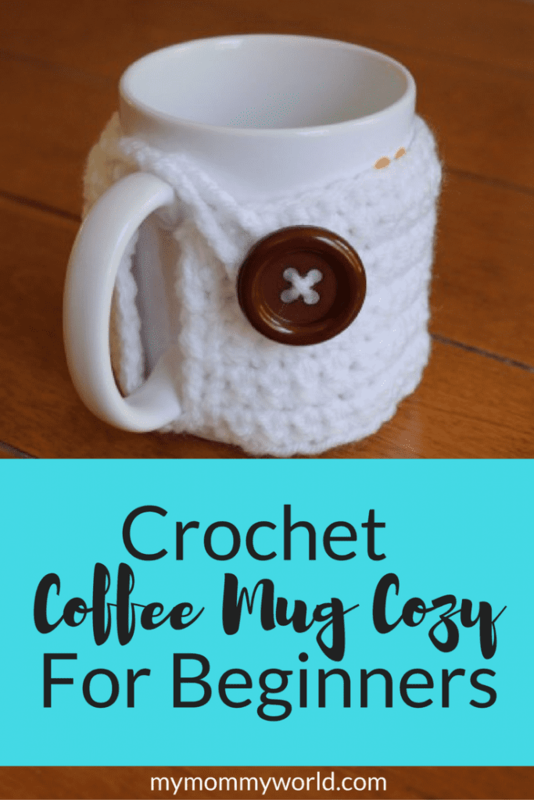 I hope you enjoy making your own coffee mug cozy! This is such a great project. This one would be perfect for my daughter to make for her grandma. Thanks for sharing the tutorial. How awesome is this!? I need one! Thanks for stopping by Creative Spark Link Party. Hope to see you back next Wednesday! Great pattern! Love the cozy and a video too 🙂 Sweet!! Thanks so much for posting this fantastically awesome project on moneysavingmom.com! Thank you so much! The simplicity of your tutorial made it doable for me!! Wish I could post a pic to show!! Thank you!! Thanks so much for stopping by today to leave a comment! I think I used an H hook in the video, but you can use pretty much any size hook…just be sure to measure against your mug as you go to make sure it fits.